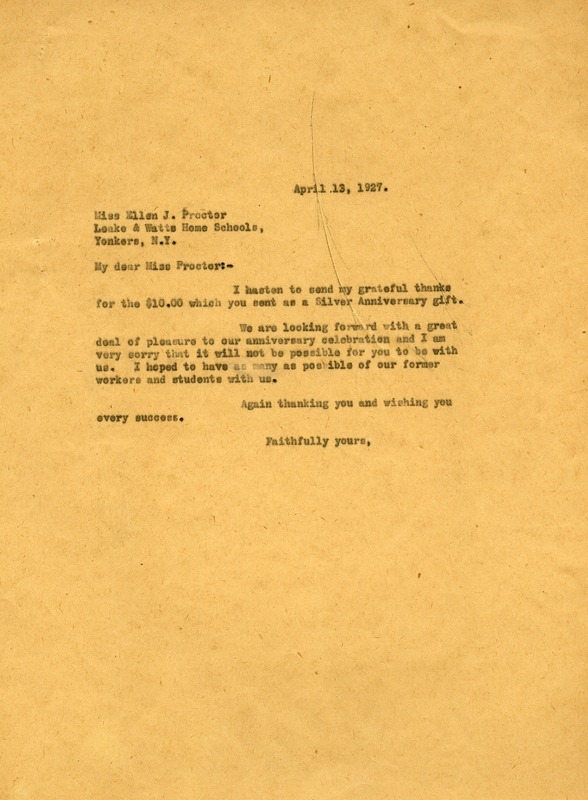 Letter to Ellen J. Proctor from Martha Berry thanking her for the $10.00 she sent in honor of the silver anniversary of the schools. Miss Berry states that everyone at the schools are looking forward to the impending celebrations. However, she expresses her sadness that Miss Proctor could not join them for the festivities because she would love to have all of her former workers and students at the celebration. Martha Berry, “Letter to Ellen J. Proctor from Martha Berry.” Martha Berry Digital Archive. Eds. Schlitz, Stephanie A., Haley Fortune , et al. Mount Berry: Berry College, 2012. accessed April 26, 2019, https://mbda.berry.edu/items/show/5465.